Posted On July 19, 2016 by Team iCynosure. Women today are opening up to recognising the need for female hygiene products which has, in turn, revamped the product markets. The demand for quality products has risen drastically, almost 25% in India itself which has pushed brands to constantly try and innovate to bring consumers products that are not only comfortable but also that cater to very specific needs. Unicharm's Sofy is a brand that has been improving the traditional hygiene products to make them more appropriate to the changing dynamics and lifestyles of women today. 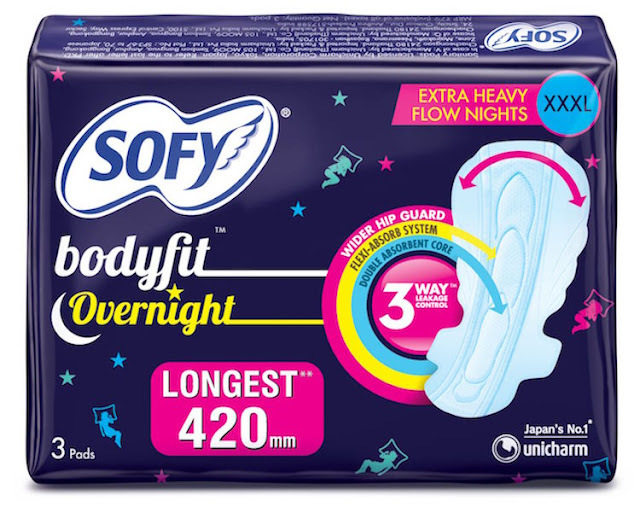 Since the time I discovered the brand, I've been using their sanitary napkins and have been pleasantly surprised with their revolutionary product Sofy Sidewalls. It is my constant companion due to the irregular and inconsistent cycle that plagues me month-on-month. The best part about the product is that it offers protection from all the unassuming flow variations that I cannot foresee. Each night during 'those days' I fight my thoughts about sleeping ugly, waking up every few hours to change the night pad to ensure there is no leakage or overflow embarrassment. 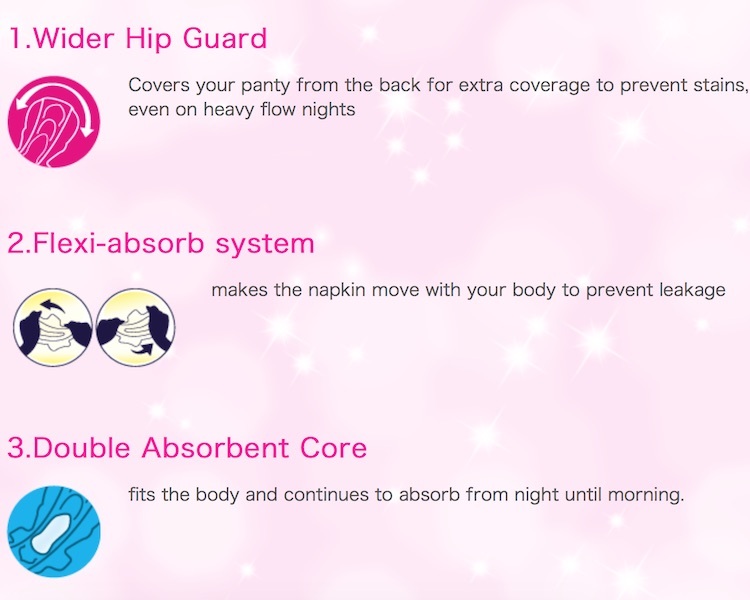 Just recently the brand launched Sofy Bodyfit Overnight, a product that pegged to be the longest napkin offering a wider hip guard that will line the underwear broader on the back than a regular napkin for extra coverage. 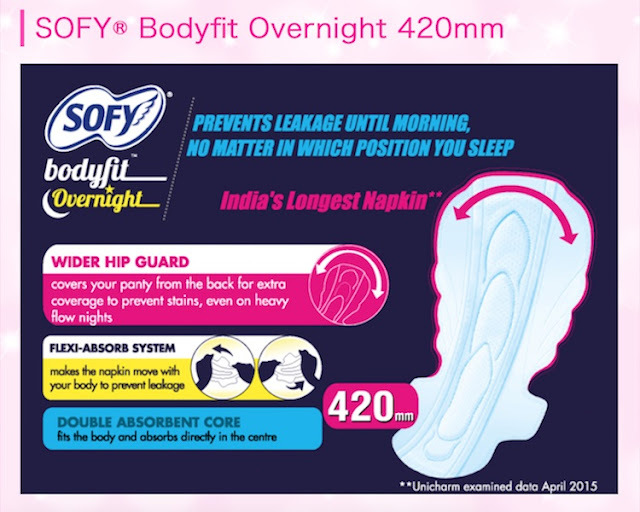 The brand claims that the new product developed ensures a comfortable and peaceful sleep experience during periods due to it specifically designed leak protection system. A trial was in accordance and when I first received the product what struck me the most about Soft Overnight was the 'Prevents Leakage Until Morning' promise. Added to this were the features of a Wider Hip Guard, Shape Maintenance System and Double Absorbent Core. Though my expectations were pretty high due to my history with the brand, I approached it with a little resistance. On use over the last two months, I can confidently say that the product has surpassed my expectations. With the new technology and the first-of-its-kind innovative concept used in the product, I have had great periods. The dryness I felt even during a heavier flow and use over an extended period has confirmed its great absorbing capacity. Also the fact that the back covers a larger area than normal napkin arrests the leakage problems. However, the clincher for me was the shape maintenance system that keeps the pad in position no matter what I do. Whether I'm doing the daily chores, moving around town or sleeping the pad doesn't budge from its place. I've got less conscious about 'those days' and worry-free about 'those nights' and can now sleep as ugly as I wish to. Have you tried Sofy? What has been your experience with their sanitary products?